The Mirror of Race is a project and website by curated by Suffolk philosophy professor Gregory Fried. 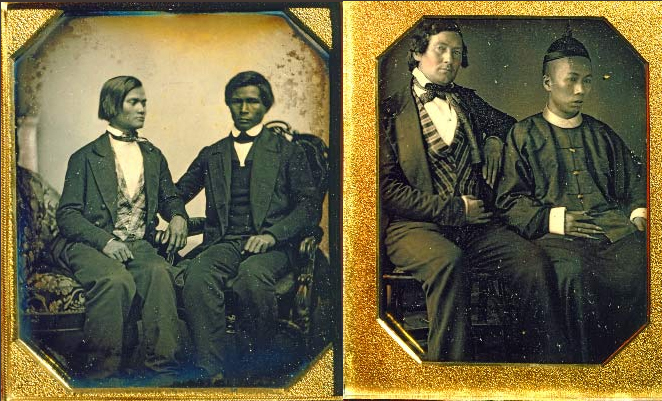 Through the study of old photographs (1839 - 1876), Fried and the project's staff hope "to discern and address how these images from the past dis­lo­cate our own present pre­sump­tions about the rep­re­sen­ta­tion of race." The website accomplishes this by presenting the photographs first without context and asking the viewer to reflect on what they think they see. Then, with the click of a button, they are given the factual context of the images, allowing them to compare their impressions with what is actually known about each image. As the website says, "Daguerreo­types are, in strict point of fact, mir­rors. Each one is a unique image pro­duced on a reflec­tive, silver-coated cop­per plate. In such pho­tographs, we see our­selves in two senses: we see our ances­tors and so our past, but we also see our own reflec­tions on the same sur­face." Through these photographs, the viewer is given the opportunity to reflect on history, their present society, and themselves.